NYC Recession Diary: ORIGINS: Free minifacials though Aug 2! ORIGINS: Free minifacials though Aug 2! Round up the girls! Origin's free minifacials are back! 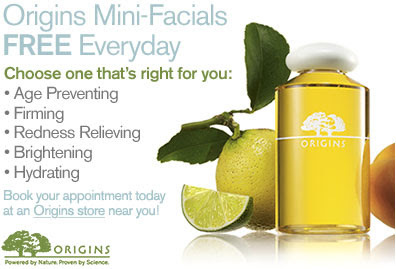 Everyday through August 2nd you can go to Origins retail stores to get a free Mini-Facial. Readers can call or stop by Origins to book their appointment today. I did this promotion last time, and it was a delightful 20 minute escape from the day. Highly recommended!